Comfort, convenience, and efficiency... all in one small Etekcity package! Hey there friends. More and more, computer users have been switching out those desktops for laptops. Lets be honest friends, unless you have a gaming computer, you probably don't own a desktop computer. Laptops are just that much more convenient. The downside of a laptop, though, is that they usually don't come with a mouse. Now, it's not that you need one. All laptops come with a mouse type device. About 99% of them have a touch pad. While touch pad are pretty convenient, they are not for everyone. While there are many great gaming mice out there, what if you want a simple, easy to use, mouse for everyday browsing? If this is what you are looking for, then you need to pick up the Etekcity E1 Scroll Wireless Optical Mouse! Our awesome friends at Etekcity provided me with a wireless mouse to try out and review and let me tell you right now, it does not disappoint. Before I get into the specs and written review, check out my video review. First impression, it's a lightweight mouse that feels good in my hand. This is a right handed mouse and the design is perfectly made with comfort in mind. The silver and black color suits me perfectly. They are one of my favorite color combos (the other being black and red). As for the buttons, you don't have too much going on so the mouse does not feel overwhelming. You have your standard left and right click buttons, the scroll wheel (which is also a button), a DPI switch button, and two forward and back browsing buttons (more on these later). On the bottom of the mouse, you have the battery compartment, the on and off switch, and the wireless receiver. I love that the USB wireless receiver is neatly tucked in. You will need to pull this little guy out and connect it to your computer's or laptop USB port so that the mouse can connect to your device. So let's get into my experience with the Etekcity Scroll E1 Wireless Optical Mouse. Connecting was a breeze. After inserting the USB wireless receiver into my laptop (Windows 7), drivers for the Etekcity mouse started to download. I absolutely LOVE that. I love efficiency. I hate having to look for a disc to download drivers. What if the disc is lost? Then you would have to go online to get drivers. What if you get the wrong ones? Then you'll have to go and look for the correct ones. You avoid this hassle COMPLETELY by having the drivers automatically download from the USB wireless receiver. It took no longer than 10 seconds before it was done. I grabbed the mouse, switched it on, and BAM! It's working! Quick, easy, convenient, and downright awesome! And because the mouse is an optical mouse, you can pretty much use it on any surface. I started browsing the web to give the mouse a good test run. The feel of the mouse is wonderful in the palm of my hand. The left and right side of the mouse is made of plastic but the part of the mouse that touches your palm and fingers has this slight rubbery feel. It provides just enough grip to assure that you have a good handle on the mouse. This is especially helpful when your palms start to get a little sweaty. On the thumb's side of the mouse, there are 2 arrow buttons: the back and forward buttons. Now these are pretty cool. Web browsers have the forward and back arrows on their browser but having them conveniently placed and accessible by your thumb give the Etekcity E1 Scroll Wireless Optical Mouse a leg up on the competition. You don't have to program the buttons, it's already configured for you and they work like a charm. The scroll button also acts as a third mouse button. I know that with the laptop touch pad, you can activate the third button by pressing both the left and right click buttons, the E1 Scroll eliminates fumbling by having the scroll wheel also act as a button. As for the DPI button, it's a nice feature to have, but I am almost certain that those of us that purchase this mouse will have little use for it. The settings are preset at 500, 1000, and 1600 DPI. The 500 DPI setting will rarely be used so I'm sure you'll settle on 1000 or 1600 DPI. It all depends on preference. Simply click on the DPI switch button and use the configuration that best suits you. The mentality that you should have with the DPI switch button is a "set it and forget" mentality. USB wireless receiver compartment on the bottom. The one and only negative thing (and even then it's not really negative) about this wonderful mouse is that it runs on batteries. But to be honest with you, I think I'm just spoiled. I own all kinds of devices that run on rechargeable batteries. 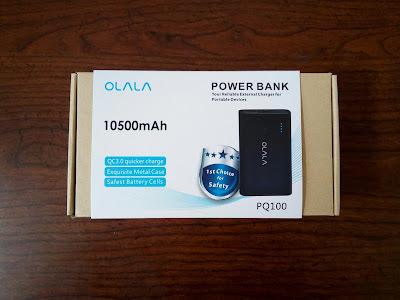 You simply charge them up with your micro USB charger and you are good to go. 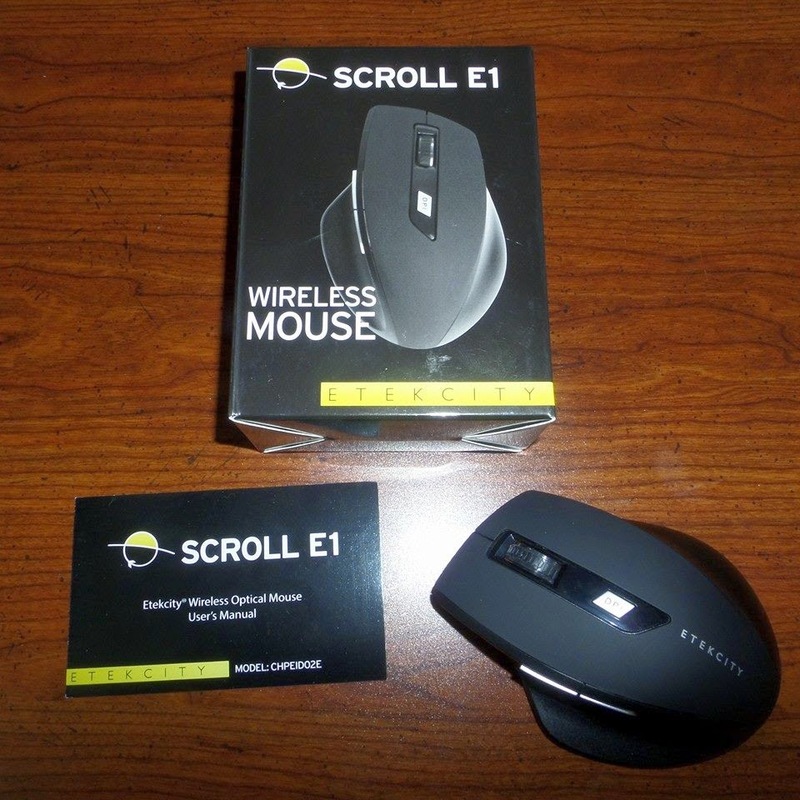 The Etekcity E1 Scroll Wireless Optical Mouse uses 2 AAA batteries. It's not a deal breaker for me and actually, it's not that big of a deal, but I just felt like it was a small something something that I needed to bring to your attention. Despite what was just said, I LOVE the fact that Etekcity helps you conserve battery life. If the mouse is on and is not in use for several minutes, the mouse will automatically go into sleep mode! This will help conserve those batteries! To wake the mouse up, simply click on one of the buttons and your mouse will reactivate without a hitch! Good looking out for us, Etekcity! The Etekcity E1 Scroll Wireless Optical Mouse is one must have mouse for everyday use. It's extremely comfortable, extremely convenient, and extremely efficient. You don't get this trio of perfection in many products but Etekcity managed to pull it off, and all at a relatively low price. You can pick up this great optical mouse now at Amazon for only $15.99! At this price, you simply won't find a better mouse. So what do you think? Will you be picking one of these bad boys? What kind of experiences have you had with wireless mice? Let us know in the comments! Later!